The Cumberland & Dumfriesshire Farmers Mart P.L.C. had forward 47 prime cattle, 24 over thirty month cattle, 4,993 prime hoggs and 2,882 cast ewes & rams at their weekly sale at Longtown on Thursday 8th April, 2010. Clean cattle met a similar trade on the week to a top of 183.5p for a smart Limousin heifer from A. & W. Taylor & Son, Dashwellgreen, Longtown and purchased by J.A. Jewitts Wholesalers; Belgian Blue 180.5p Guardrum; Charolais 169.5p Hallburn. Bullocks to 171.5p for Limousin from Haining House; Blonde d’Aquitaine 168.5p Haining House; Angus 168.5p Burnfoot on Esk. Over Thirty Month cattle met a sharper trade and more could have been sold. Top price of 129.5p for a Limousin heifer from D’Mainholm and 125.5p Bleatarn. Cows to 118.5p, 117.5p and 113.5p The Becks; British Blue 109.5p D’Mainholm; Blonde D’Aquitaine 101.5p Pennersaughs; Friesian 88.5p Evertown, 86.5p Brisco Hill; Shorthorn 81.5p Potholm; Blue Grey 79.5p Potholm. Bulls 98.5p for Welsh Black from Whitslade. A record breaking day was on the agenda as the 4,996 prime hoggs levelled out to average an exceptional 210p per kilo. Good quality export types were keenly sought after meeting the best trade ever witnessed with the 3,796 hoggs under 46 kilos averaging 216.9p per kilo. Top price of 284p per kilo for Texels from S. Stoddart, Hillside and to £129.50 per head for Suffolks from Messrs Douglas, Catslackburn; Texel £127.50, £116.50 Hillside; Beltex £118.50, £115.50 Hillside; Bleu d’Main £118.50 Hoddamtown; Blackface £102.50 Yett Farm, £98.20 Smalmstown; North Country Cheviot £99.80 Hoddamtown, £97.80 Whins; Hill Cheviot £99.20 Shaw Head, £98.20 Land Farm; Greyface £97.80 Finnieness, £95.80 Golden Lane; Charollais £97.50 Finnieness, £97.20 Carliestown; Lleyn £93.80 The Mark, £89.80 Pilmuir; Zwartbles £90.50 Bogra; Leicester £90.50 Hardhurst; Herdwick £90 Branteth; Swaledale £88.50 Castle Nook, £84.50 High House; Kerry £87.80 Riggshield. The 826 lightweight hoggs sold to £79.80 for Blackfaces from Glenshanna, £75.80 Netherwood; North Country Cheviot £78.80 Naddle; Greyface £78.50 Finnieness; Texel £78.20 High House, £75.80 Crawfordjohn Mill; Beltex £76.80 Finnieness; Hill Cheviot £75.20 Tushielaw, £74.20 Castle Nook; Swaledale £73.80 Naddle; Suffolk £70.50 Chapel Farm. A smaller show of 2,882 cast ewes and rams saw trade sharper on the week for all classes. 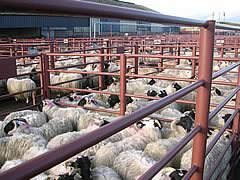 Heavy ewes were short of buyers requirements resulting in an average of £109.87 and hill ewes were again in short supply with an average of £60.92. Top price of £163.50 for Texel rams from Roadside, others £150.50 Rashee; Charollais £148.50, £138.50 Golden Lane; Suffolk £148.50 Roadside, £136.50 Rashee; Leicester £137.50 Roadside; Hill Cheviot £118.50 High Road; Dorset £98.50 Newry; Lleyn £96.50 Golden Lane; North Country Cheviot £96.50 North Deanhead; Blackface £80.50 Newbigging and Sockbridge Hall, £78.50 Sorbie; Swaledale £70.50 Fossway. Heavy ewes to £160.50 for Suffolk from Land Farm, £158.50 Golden Lane; Texel £158.50 Newry, £155.50 Dunjop; Charollais £156.50, £144.50 Thackwood; Beltex £138.50 Newbigging; Bleu d’ Maine £138.50 Netherwood; North Country Cheviot £134.50 Dodgsonstown, £122.50 Newry; Half Bred £130.50 Hoddamtown; Leicester £125.50 Fordlands, £124.50 Alton; Ryeland £122.50 Golden Lane; Greyface £121.50 Stackbraes, £118.50 Castle Nook and High Dubwath; Rouge £106.50 Mountfield. Hill ewes to £102.50 for Cheviots from Smalmstown, £101.50 Sorbie, £100.50 Newbigging; Blackface £88.50 Farmers Close, £86.50 Hardhurst, £84.50 Wanwood Hill; Swaledale £75.50 Castlenook, £74.50 Fordlands; Herdwick £66.50 Winterhope, £65.50 Farmers Close. Goats sold to £85.50, £83.50 Coytre.